While there are some other topics to cover, we’ve come to the end of the player portion of our 2018 Season Reviews. Therefore, we’ve covered all of the important players (and plenty of replacement level ones as well). That leaves the miscellaneous relievers that racked up innings as the last guys in the bullpen or received a spot start and little else. Let’s get to them! After debuting over 16 games in 2017, Gio Gallegos’s sophomore campaign was both brief and mostly irrelevant. He made four appearances for the Yankees, coming up as the eighth or ninth guy in the bullpen and the average leverage index was 0.23. He would throw two innings in May and then came back up as an extra arm for the Phillies/Red Sox series in late June. The game against Philly was his best in New York as he tossed three shutout innings of relief, striking out six batters. He’d come up as the 26th man for the July 9 doubleheader in Baltimore and got a save with three innings of OK pitching. 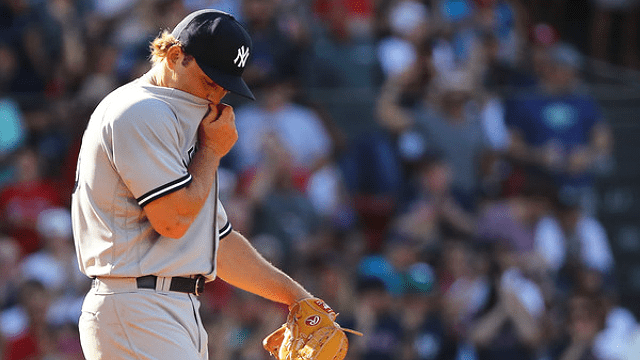 On July 29, he was dealt along with Chasen Shreve for international money and Luke Voit, ending his Yankee tenure. He would throw two games for the Cardinals after helping their Triple-A team to the National title with a walk-off hit. Yes, you read that right: a base hit. David Hale signed with the Yankees three separate times in 2018 and made one appearance per signing. The Princeton University product tossed two scoreless innings in the April 23 blowout of the Twins and was subsequently designated for assignment. The Twins picked him up and he gave them one bad outing before yet another DFA. His last two outings, May 11 and July 6, came in relief of Sonny Gray after Gray was shelled by the Athletics and Blue Jays, respectively. He saved his best for last up in Toronto when he gave the Bombers 5 2/3 innings of one-run ball, keeping them in the game even if they would eventually lose. A week after his last Yankee appearance, he signed with the KBO’s Hanwha Eagles and made 12 starts with them to end the season. Take a chance, take a chance, take a chance? After J.A. Happ was stricken with hand, foot and mouth disease shortly after his New York debut, the team needed another starter. Domingo German and Jonathan Loaisiga were both hurt and Chance Adams was on turn, so the Arizona native got the call. His task? Face the eventual World Series champion Red Sox. Adams held his own in Boston. He allowed a pair of homers and three runs over five innings, holding the Sox to just three hits and a walk. Considering his struggles in Triple-A, it was better than expected. However, he got just one run of support in a loss. The 24-year-old made just two more relief appearances in the majors the rest of the year. He gave up four runs to the Marlins and threw a scoreless inning on the last day of the season, again in Boston. He pitched to a 4.78 ERA while repeating Triple-A, taking plenty of shine off his prospect status. However, with both his age and previous success, there’s still something to hope for with Adams. He’s on the 40-man roster now and should get another chance, perhaps in relief. We detailed Stephen Tarpley’s LOOGY status late in the season, so I’ll spare you most of the details. 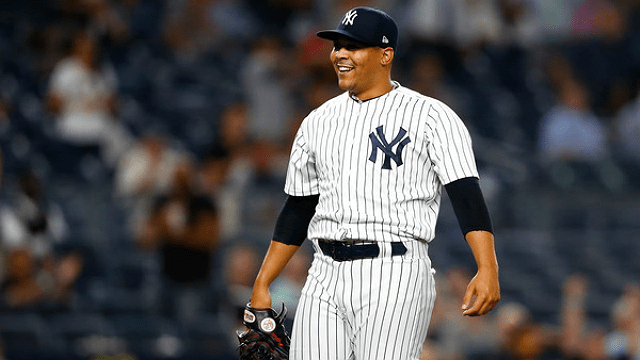 He struck out 13 over nine innings in the Bronx after receiving a September call-up and worked around some control issues to hold opponents to three runs. Not bad for one’s first taste of the majors. Left-handed batters faced Tarpley 18 times and reached base just four times, three via walks. Eight struck out and none got extra bases. That’s pretty superb in an extremely small sample size. After being groomed for a 25th-man/LOOGY role for the postseason, he was tagged for three runs in the Yankees’ 16-1 Game 3 loss to Boston. The team likely wanted him to take the final two innings but gave the ninth inning to Austin Romine instead. Tarpley will now ride the shuttle between the Major Leagues and Scranton as a matchup lefty and long reliever. His two-seamer and sinker make him worth the 40-man roster spot and a longer look in the majors. I’m a big fan and think he could stick, though perhaps not in the Bronx. Justus no longer rules in the Bronx after just three appearances. His September debut came with a nine-run lead, yet he loaded the bases and narrowly escaped unscathed. Sheffield allowed an inherited runner to score in Tampa Bay a week later and was beat up by the Red Sox on the season’s final day. The 22-year-old starter’s control issues made him unlikely to claim a Major League spot to begin 2019 and cast doubt on his future as a starter. Therefore, he was expendable as the headlining piece of the James Paxton trade, the Yankees’ first big move of the offseason. In Seattle, he’ll get a bigger ballpark and a longer leash to develop. Hope to see him back in the Bronx as an opponent soon! Forget about George Kontos’ role for the 2018 Yankees? Me too. With the Yankees looking for a depth arm in early August, they purchased Kontos’ contract from the Indians. That brought Kontos’ career full circle after he was drafted by the Yankees and came up with them in late 2011 before being traded for Chris Stewart. In his only game, he took over for an ineffective A.J. Cole and delivered 1 2/3 scoreless innings during an 8-5 loss to the Mets. If the game had any historical significance, it was as one of Jacob deGrom’s 10 wins of the year. Other than that, just makes Kontos a good name for the end-of-the-year Sporcle quiz. The phantom ballplayers! Ryan Bollinger and Domingo Acevedo didn’t actually pitch for the Yankees in 2018, but they both spent brief moments on the 25-man roster. The team gave them call-ups when they were short on arms and sent them down immediately afterwards. It was particularly frustrating to see Bollinger not get a chance. The 27-year-old southpaw is a former 47th round pick and worked for years in the independent leagues to return to affiliated ball. He even pitched in Australia (and has gone back there this offseason). The Yankees gave him 20 starts in 2018, most of which came in Double-A Trenton’s employ. Ultimately, he was called up twice., but he ever got into a game. Hopefully next year is the year. As for Acevedo, the 24-year-old received a similar fate. He was added to the 40-man roster before the season and was called up straight from Trenton in July. Perhaps he would have gotten a September cup of coffee, but injuries kept him away, plus the team had plenty of arms. He was fine in Double-A and unlike Bollinger, he’s still on the 40-man roster. His debut could be in the cards next season.